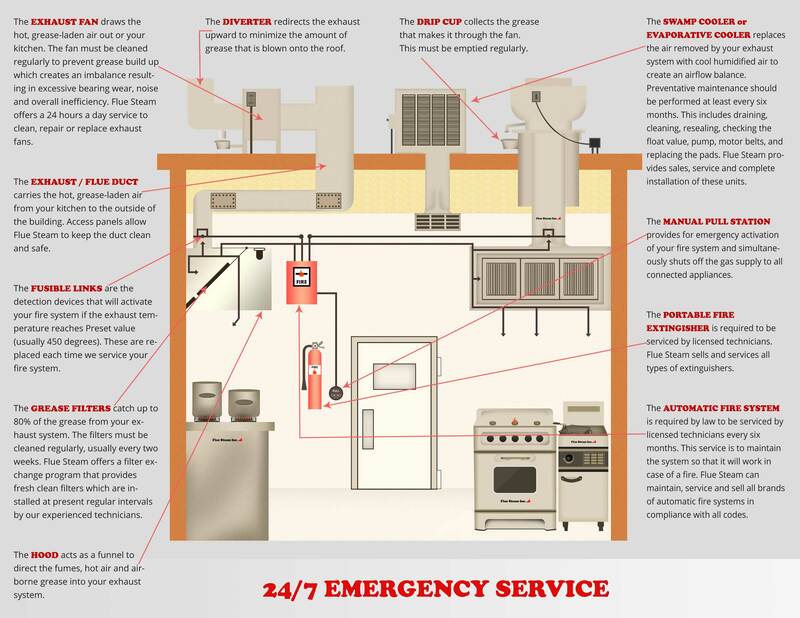 Whether or not a surface is covered by fire codes, you need to get that grease off of it! If you own or operate a commercial kitchen—especially one that prepares a lot of fried foods—you are no doubt familiar with the challenges and dangers posed by grease buildup. Hopefully you are keeping up with your grease removal and cleanup activities in a way that will not only protect your property from fire damage and your employees from danger, but also protect your business from being cited for fire code violations. Flue Steam can handle most—but not all—of your grease removal needs. As a general rule of thumb, just remember that if the activity is required by your local fire codes, we can handle it. Here are the most important items to keep grease-free. Grease Filters: Grease filters are designed to catch vaporized grease and remove it from the air before it has a chance to reach your ductwork. As your exhaust system’s first line of defense against grease, naturally they can get very dirty very quickly. The most convenient way to ensure you always have clean grease filters is to sign up for our grease filter exchange service. Exhaust Hoods: Exhaust hoods can also get greasy fast, especially if they are above a deep fryer or other piece of cooking equipment that generates a lot of vaporized grease. Flue Steam provides hand scraping services to help keep grease buildup on your exhaust hoods to a safe level and reduce your fire risk. Exhaust Ducts: Grease accumulates more slowly in your ductwork than on your exhaust hood, but it can be much more dangerous. If a fire ignites inside the ducts, it could easily spread throughout the building. Flue Steam can keep every nook and cranny of your ducts clean with our steam cleaning service. Exhaust Fans: Depending on how long your exhaust ducts are, a goodly amount of grease may accumulate on your exhaust fan. This can pose serious problems because it may slow down the fan, which will affect airflow, comfort, and safety in the kitchen. A greasy fan may also experience accelerated wear and tear and break down faster. Flue Steam can help protect against fan problems by cleaning your fan every time we do a steam cleaning. Cooking Equipment: Grease splattered around hot cooking surfaces has the potential to ignite. It’s these sorts of small flames that can flare up and spread to your exhaust hoods and ductwork, so be sure to clean grease spatters off your cooking equipment frequently. Floors: If grease accumulates on your floors, employees may be at risk for a slip and fall accident. Not only will this cause them pain, it could cost your business money. Prevent accidents by cleaning floors daily with a specially formulated grease removing product. Hot Boxes: One final place grease can buildup is inside the hot box, aka proofing box or steam box, where cooked food is kept warm until serving. Grease inside here is just plain gross and can cause odors that will affect food quality. Have your staff wash and dry the inside of the hot box regularly.